Updated July 5: I have added new links to the list at the start of the post, and commentary on them down at the end. A few posts back, I wrote about the two main options proposed by the TTC for the Waterfront West LRT (WWLRT) route between Bathurst Street and Exhibition Loop. This post stirred up a good deal of email as the implications of the plans for Fort York became apparent. Recent events and actions by the TTC regarding the WWLRT and its proposed alignment are rather strange. This route has suddenly jumped from the bottom of the barrel among future Transit City routes, to a high priority project for which the TTC seeks funding. Have they finally discovered that there is a large and growing population living just west of downtown which threatens to become a car-oriented “suburb” without substantially improved transit? Better late than never, I suppose. However, the process is leapfrogging ahead with a major new “preferred option” that has not been subject to public review. Indeed, the report itself appeared at the last minute on the Supplementary Agenda for the June TTC meeting. At least one Commissioner had not read it before the meeting, and there was only perfunctory debate. There were no deputations or critical voices because nobody expected the report. Meanwhile, various aspects of the entire WWLRT EA are supposed to be on hold at the request of local Councillors pending integration of the EA with other planning work underway for waterfront districts. If this is an indication of how the TTC plans to use or abuse the new, streamlined EA process for transit projects, then we are in for some major battles on Transit City and on Metrolinx’ Regional Plan. The more people distrust an agency’s intentions and expect that it will ignore their concerns, the more combative and obstructionist they will be. This is not the setting we need for widespread expansion of transit services, and the TTC would do well to be more sensitive to community input. The WWLRT was originally proposed as a way to move passengers into the developing central waterfront and core area via a new route from southeastern Etobicoke. The route would have started at a new loop near Legion Road (in Mimico), run east via The Queensway and King Street to Dufferin, then south to the Exhibition Place. The route would have looped south and east past Ontario Place, then east into downtown along what eventually became the 509 Harbourfront route. A second stage involved a separate east-west line in the Front/Bremner corridor from Union Station to Sunnyside (Queen and Roncesvalles). Very little of the original proposal was actually built, and we have proceeded by “amendments” to the approved scheme to the point that almost nothing of the original remains. Ontario Place refused to allow its parking lot to be converted as a major transit station (a decision they came to regret years later as the isolation of their site worsened), and the National Trade Centre was built on the old Exhibition Loop property just inside the Princes’ Gates. Both of these decisions relegated transit access to the space under the Gardiner Expressway behind the Colliseum and the Horse Palace. By 2005, the reconstruction of Fleet Street was about to occur, and out came a new design. This is substantially what was built and is only now in the final stages of construction. By this time, the original plan for “Bremner Boulevard” as it appeared in earlier reports had evolved into the Fort York Boulevard we know today. However, this road was not intended as a major transit route, and no provision for transit lanes appears on it in any of the designs from this period. By late 2007, the WWLRT had been incorporated into Transit City and included all of the Lake Shore trackage right to the end of the former Long Branch line at the western edge of Etobicoke. The Legion Road loop plan had been abandoned due to technical difficulties, and it was replaced with a new scheme for a loop at Park Lawn. Also underway was the EA for the link from Sunnyside to Dufferin. In a November 2007 report, the TTC compared the seven Transit City routes to determine which three should be undertaken in the first round of studies and construction. The WWLRT was not among the top ranked projects. In April 2008, the TTC reported that a further EA amendment was on the verge of completion covering the section through Parkdale (Exhibition to Roncesvalles). However, this work is on hold pending the outcome of a general study of the Parkdale Waterfront neighbourhood into which the WWLRT must fit. The Bremner Boulevard project is not mentioned at all, nor is the EA for the Exhibition to Union portion of the WWLRT. This route, east of Bathurst, will run in the new right-of-way in the middle of Fort York Boulevard (see note about street names above) and then in the existing (and likely to be reconfigured) Bremner Boulevard to a portal near the new Lower Simcoe Street. From here the line will run underground through spaces reserved in developments south of Union Station into the Bay Street tunnel and Union Loop. A discussion of that loop is a subject for a future post. [That the TTC] request Metrolinx to provide funding for this vital component of the Transit City Light Rail network, because it will provide a sustainable-transportation alternative for residents and workers in what will soon be one of the most densely-developed areas in the entire GTHA, and will lay the foundation for the Waterfront West Light Rail Line. At last, the TTC is looking at the Harbourfront line not just as an occasional trolley wandering through the Bathurst Quay neighbourhood, but as a major connection from the developing Fort York neighbourhood into the core. Moreover, there is a push to get this report to Metrolinx asap so that it can be included in the forthcoming plans and funding announcements. The projected demand is of particular interest when we consider that in November 2007, the maximum peak hour forecast for the WWLRT was 2,200. This and other numbers have subsequently been revised upwards, but still give no indication of the all-day demand cited above. The Queen car is longer than the WWLRT and feeds into downtown from two directions. The 44,800 would-be riders of the WWLRT only represent the west side of the city, and will require substantially more frequent service than that now advertised (let alone operated) for the 501. This triggers a crisis in intersection capacity at Fleet and Bathurst and, to a lesser extent, at Fort York Boulevard and Fleet. The solution? A new alignment branching north from Exhibition Loop into the rail corridor, through the abandoned GTR cut under Strachan Avenue and into Fort York Boulevard just west of Bathurst Street. Neat. Elegant. It even impressed me, until I found out that the land to be used was not quite as available as the TTC makes it out to be. I will not attempt even a brief history of Fort York, but recommend several websites and reports linked above to those who want all the details. This fort is a hidden, almost forgotten part of Toronto’s history. If Fort York were like colonial-era buildings elsewhere that still actually stand on the water in their historical context protecting a harbour, it would be well known as a link to the city’s origins right on the waterfront. Instead, it is landlocked. The original shoreline lies just south of the fort under the north side of the Gardiner Expressway. It was to this shore that the Americans sailed an invading fleet in the War of 1812, and on April 27, 1813, the invasion was met by the explosion of the fort’s arms magazine. The crater from this explosion remains at the site although it has been overgrown during the past centuries. This part of our waterfront, unlike lands further east, was reclaimed as open space, but it has an industrial, and earlier a military past. North: The CN rail corridor extending from a little east of Bathurst to a little west of Strachan where it meets the former GTR cut. West: A small triangle of land made up of the GTR cut west of Strachan, plus Strachan Avenue itself south to Fleet. South: Fleet from Strachan to Fort York Boulevard, then northeast along the sidewalk line of that street to a point just east of Bathurst. East: At the east end, there is a small piece of land east of the Bathurst Bridge. The Bathurst/Strachan Secondary Plan (now known as the Fort York Neighbourhood Secondary Plan) contains a map of “heritage features”, and its view of the bounds of the Historic District correspond to an earlier, smaller protected area. This is odd considering that the bounds were expanded to their present scope before the Secondary Plan was published. Possible conversion of the Armoury on the north side of Fleet Street to a school. Conversion of the parking lot at Fleet and Strachan to parkland. Retention of the Garrison Road bridge over the GTR cut as a link from the school/Armoury lands to the parkland west of the fort. Regrading of the GTR cut as a location both for parking and for a visitor centre. This would allow parking now on the upper, historic plateau of the fort to be removed. Use of the triangle beyond the GTR cut as a new location for service buildings that now intrude on the historic portions of the fort. Improvement of the green area between the fort’s south ramparts and the north sidewalk of Fort York Boulevard to set off the fort itself. Reconstruction of buildings so that the main site is restored reasonably close to its post-invasion configuration. What the exploding magazine didn’t destroy, the Americans burned, and no pre-1812 building survives at the fort. However, several postwar buildings were lost over the years, and they will be rebuilt as part of the fort’s plan. The TTC’s preferred alignment for the WWLRT runs right through the south end of the National Historic Site including the greens south of the ramparts, the GTR cut and the land west of Strachan. The master plan for the Fort which has been in place for many years is threatened by this design. When the TTC started to look at the traffic volumes on the WWLRT, the 511 Bathurst and the 509 Harbourfront cars, I suspect there was a rather loud “Ooops!”. The Fleet Street EA amendment includes projections of traffic volumes at various intersections, and there is no hint of capacity problems. Times have changed, and the TTC now recognizes that the service planned for Fleet Street won’t fit through the Bathurst/Fleet intersection, especially if all of the WWLRT service goes to Union via Queen’s Quay. This would require a frequent service to cross Lake Shore Boulevard which has very long east-west green times with only infrequent breaks for transit. Indeed, I have learned in correspondence with the TTC that there may even be problems with capacity at the just-completed intersection of Fort York Boulevard and Fleet Street. 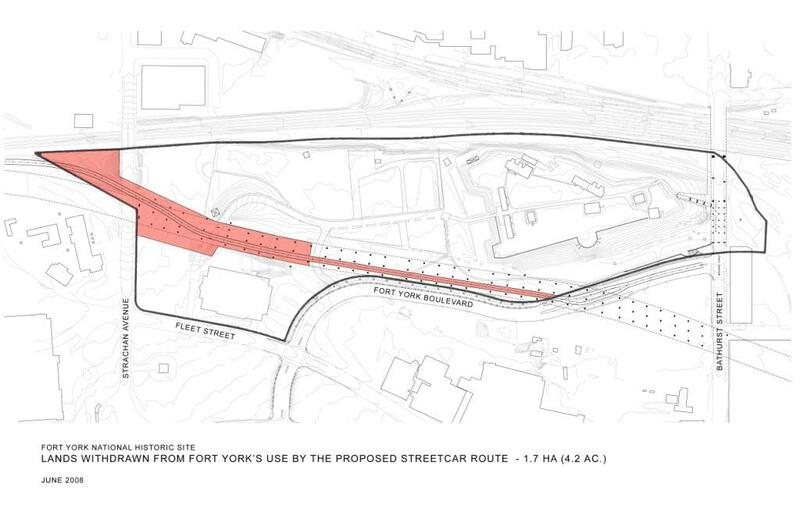 The traffic problems lead the TTC to propose the “Under Gardiner via GTR Cut” alignment through the Fort York lands. This diverts all of the WWLRT service (and possibly others) completely off of Fleet Street. The projected saving in travel time due to a shorter route and fewer pesky traffic signals is about 20%, although this is only for the Exhibition to Union link as compared with the existing 509 Toonerville Trolley along Queen’s Quay. interference between eastbound “Fleet” and “Fort York” services each of which has its own signal phase. If the “wrong” car shows up, it will be delayed. This is based on a fixed signal sequence rather than true signal priority that would adapt to whatever traffic was present. Queueing problems westbound at Strachan where the farside stop can only hold one car. This begs the question of why this stop exists at all in the new design when there is a stop in front of the Armoury only half a block east. What we have here is a confluence of piecemeal planning and a slavish adherence to the idea that we must serve auto traffic at all costs. On the road side, we are still obsessed with accommodating auto traffic, and transit schemes everywhere are skewed to ensure they don’t inconvenience motorists. That might be a valid approach in the car dominated suburbs, but at some point downtown we have to say “Enough!” and admit that cars will be limited in their space and freedom at intersections. If we can’t engage that battle in the heart of the city, how can we hope to change travel habits in the suburbs? As I write this, the TTC’s view is that it has a “best” and “second best” proposal. They prefer the “GTR Cut” route, but can live with the route via Fort York and Fleet. Supporters of Fort York are incensed that a major incursion in the Historic Site was proposed without consultation and in a manner that gives the appearance of slipping around the EA process. Yes, there will be another round of “public consultation” in the fall. Will the plan by then have achieved inevitability and Fort York’s supporters be reduced to a five-minute deputation, ignored by most Commissioners unwilling to challenge the staff position? This is not the sort of issue to be settled in the contentious setting of the final days of an EA, but something that requires all parties to sit down and agree on the tradeoffs and come to a workable design proposal before the final, formal public meeting. Years ago, the original Harbourfront line was to be on the surface of Bay Street, but at considerable cost (and construction difficulty) it was buried all the way to Queen’s Quay. Why? Because the then City Works Commissioner, Ray Bremner (yes, he of the Boulevard), wanted the transit right-of-way at Bay and Queen’s Quay for a left turn lane. It’s time for transit designs to stop making way for road capacity, and the WWLRT route serving Fort York is a good place to start. I have added four links to this post today to show other aspects of the Fort York issue. First is the proposal for a cycling and pedestrian bridge linking the northwest corner of the fort across the rail corridor to the south end of Stanley Park. This project is still under study. The report shows the Fort York plan and the general layout of the area (see page 11). Note the circle under the Gardiner Expressway — this is the location of the proposed Visitor Centre and it sits astride the planned route of the WWLRT. Fort York Road (the connection north from Fort York Boulevard up to Garrison Road) is actually at an elevation considerably above the surrounding “under Gardiner” area in the GTR cut. That lower area, west of the Visitor Centre on both sides of Fort York Road is intended for parking, primarily for tour buses. The upper level area now occupied by parking on Garrison Road reverts to green space. Note also the extension of green space down into the land now occupied by CNE parking at the corner of Fleet and Strachan. Second is the report on the study of infrastructure improvements for the Fort York and Railway Lands West neighbourhoods. This includes diagrams of the design for Bathurst Street south of the rail corridor. Third is the Design Review submission for the Bathurst Bridge project which should be read together with the previous report. It shows in more detail the planned layout of the new bridge. At its meeting of June 26, the Design Review Panel sent this back for reworking specifically to improve the headroom under the south end of the new bridge. The reduction from old to new is triggered by the TTC’s desire for a flat expanse at the Bathurst and Fort York Boulevard intersection large enough to permit installation of curves between the north-south and east-west tracks. The location of this intersection is determined by the existing Loblaws warehouse on the east side of Bathurst. The building shell will become the exterior of a new Superstore to be built there. Finally, I have a drawing from du Toit Allsopp Hillier showing the lands within the Historic Site that would be taken by a TTC streetcar/LRT project as currently proposed. The current westbound King 504 and Queen 501 have bottlenecks at Jameson and Roncesvalles. While the Waterfront West LRT should bypass those bottleneck, having the first phase going to Dufferin until the remainder is constructed will only add to the bottlenecks. Until the WWLRT is built from Dufferin to Roncesvalles, it will be slow unless something is done. The left turns of single occupant vehicles at Jameson is especially frustrating, when they block the 200+ in the packed streetcars. Before the first phase of the WWLRT is built, I hope that left turn lanes could be built to help with the bottlenecks, but there is very little space available. It does help when eastbound 504 streetcars are able to block the eastbound traffic, to allow the westbound left turners to move, at least until the traffic lights change. Steve: On a more general note, if King from Dufferin to Roncesvalles is going to see even more service than it has today, some serious work about real transit priority signally will be needed. By analogy to the TTC’s claims of capacity issues at Fleet/Bathurst, I wonder whether the expected volumes can be handled at Roncesvalles/Queen/King. The huge irony is that 40 years ago, the level of service at this intersection was much higher than it is today, but the moment we start messing with traffic signals, we seem to strangle traffic. If I understand it, the piece of Fort York that the streetcar tracks will cross is all under the Gardiner expressway? I’m all for preserving historic sites – but I’m not as keen as preserving the underneath of the Gardiner expressway! Steve: The issue here is that the space under the Gardiner as well the the space beyond Strachan that is the continuation of the “GTR cut” were intended for functions like parking, the visitor centre and back-of-house support that would, by their location under the Gardiner, be relatively isolated from the main part of the fort. This would allow removal of the parking now on the upper (fort) level, creation of a visitor centre that does not intrude on the fort, and removal of some support functions that intrude on other parts of the fort itself. All of this is a prerequisite to using all of the open space on the fort’s plateau for historic structures either original or recreated. Without having actually seen the site, and not knowing if this is actually feasible, would it make any sense at all to run the WWLRT through a cut and cover tunnel just below grade from Strachan to where it would join up with Fort York Blvd? If the GTR cut is already below grade, I’d think it would be too hard to build the LRT tracks and cover them with a ‘box’ which would in turn by covered by parking and buildings. Steve: There are a couple of problems. To get deep enough for a tunnel would require the LRT line to descend even further than it already has to to reach the GTR cut from Exhibition Loop. That will consume some of the surface space. Returning to the surface further east could also be problematic, and the line would do better to go under Bathurst. This is an expensive way to solve a traffic problem that the TTC’s designers failed to recognize in all the years leading up to their recent proposal. Is it possible the original projections made in 93 were made just after the original condo bust, meaning many would not have foreseen the ‘condo uprising’ in the area of Bremner/unbuilt Fort York Blvd? Also, is it not possible to at least get the Roncesvalles to Exhbition portion done first, opening up at least ROW service for a number of lines? I’m kind of interested in how they’re planning on getting down that decline. Steve: There is already the remnants of a roadway down that hill from Exhibition Loop into the GTR cut, and it should be quite possible for streetcars to negotiate the grade. The level at the GTR cut could also be raised a bit allowing for the fact that we would not be running railway trains through it. This would shave a bit off of the drop. Steve, I’ve been trying my best to find this information (I think I remember you mentioning it somewhere, but I’m currently stuck with a rough case of the flu and can’t remember), but is there a reason that the TTC has give for wanting the WWLRT line to run as part of the city network instead of the Transity City LRT style network? Steve: Considering that the line will run over the existing Lake Shore trackage, might use King and Dufferin as an interim route through Parkdale, and will run through that ever so tight Union Loop, yes, WWLRT has to be part of the “City” network. Also, none of the other Transit City lines are anywhere nearby, and there would be no connection to get WWLRT cars to a TC carhouse. Support buildings and interpretation centre off-site make sense. Though I certainly hope that a parking lot doesn’t trump an LRT line. The fort will get some benefit from having a streetcar stop at their front door. And in most major cities you don’t see parking lots for downtown tourist attractions! If there’s no historical features involved, I don’t see why Fort York just can’t work around the streetcar line. They amount of parking they have already is unreal, and there is plenty of land at the intersection of Strachan and Fleet for whatever visitor centre and support that they need. Although this TTC plan seems very late in the day, it seems to be the optimum route (short of using the Front Street Extension and putting the tracks down Front Street from Bathurst to Bay). Standing on principle that this should have come out earlier may be throwing out the baby with the bath water. Steve: The parking already at the fort is to be replaced by the new parking under the Gardiner so that the upper level can be returned to 19th century conditions. Ths visitor centre needs to be near the fort so that people can enter directly from it. As for the parking lot west of the Armoury, this will be parkland as part of the school proposed to be built inside the Armoury itself. I will be updating this post with links to other drawings to show some of what is proposed for the site. Though I generally support heritage issues, I am a bit conflicted this time and agree with Nicholas Fitzpatrick that to move transit onto the less desirable Fleet Street option to accomodate a car park seems silly. I hope that the TTC and the Fort York folk can put their heads together to ensure that the present carpark is returned to a more historic use, that the new streetcar line can get to Exhibition as speedily as possible AND that the proposed Visitors Centre can be in a prominent location. Having a streetcar stop right at its door would seem a BIG plus for Fort York. Normally, I’d never propose anything of the sort, but given that there is already a large, looming elevated structure, might there be merit in elevating the Fort Yok section to Gardner level? I recognize that accessibility issues would come in to play at the Fort York station, but overall, this seems like a far more cost-effective compromise than tunneling the line while salvaging the space under the highway. The line could elevate directly from the median of Fort York Blvd, run immediately to the north of the Gardner through the Fort York property, before dropping back down west of Strachan. Steve, could you please comment on the plausibility, benefits, and drawbacks of such a scheme. Steve: What you propose, in effect, is to widen the Gardiner structure on its north side and thereby further overshadow the fort. I think that several cannon may be trained on you even as I write this. Don’t forget also that a station on the El would double its width to four “lanes” to have room for the platforms, not to mention the vertical access (stairs and elevators). Also, I think the grade up to the level of the Gardiner from Bathurst Street would be a challenge. I am confused by your reference to putting the line underground. There is no such scheme. The debate is over which of various surface alignments to take from Bathurst to Exhibition Loop. The “telltales” warning train crews on top of boxcars of an impending bridge still hang just west of Strachan. There are also some just west of the Bathurst Street (Sir Isaac Brock) Bridge – or really its lower extension southwards. 1. I thought the Bathurst Bridge trestles would have been moved further apart to allow for a reserved lane for the streetcars. In the design submission for the Bathurst Bridge, it looks like a battle will occur between the streetcars and the single occupant cars south of the Fleet and Bathurst intersection. 2. I would have kept the Fort York Blvd. right-of-way from Bathurst up to the driveway north-east of the armory and then go under the Gardiner at that point using part of the driveway, skirting north of the armory and its parking lot. Interesting that today’s Star article on the ICE condos at York and Bremner mentions PATH and Union Station but not the streetcar line that will be passing right outside… doesn’t give much hope of seeing it any time soon, does it? Steve: Actually at that point the line will probably be underground and residents of the area will do better just to walk into Union through the new lower level concourse. THanks for all of this Steve and commenters. My brain grew numb with the layers of complexity, despite some familiarity with the issue, despite not using transit in this area at all. A key conclusion of the 1993 WWLRT EA was that the costly segment from the Roncesvalles to Dufferin area NOT be done unless it was linked to something more direct to the core, perhaps Bremner, perhaps Front. 5) other policy reasons like climate change/peak oil etc. Yet again we all seem to be ignoring the consideration of using a lot of Front and the Front St. transitway to directly deliver many into the core, with key linkages like with the GO Exhibition stop, Liberty Village, Bathurst, Spadina and the Front St. destinations ahead of Union Station. Given the WWLRT might be $750M (with the changes to the Union Station loop tacked on) shouldn’t we actually truly think about this ahead of going along with a plan so compromised that none None of the line is going on the original plan beyond a certain point; it doesn’t serve a key reason for its existence (to serve the Waterfront attractions eg. Ont Place); and we’re not seeing the comparisons of really beefing up the GO, starting a new mini-GO service from Etobicoke to Union every 15 minutes, or a direct line in on Front St., or an adaption of the Queen St. subway to DRL to Front St. ROW option. We desperately need a ripping-up of these plans, a thorough corridor study, and a good costing out of the options. I’m favouring avoiding the Ronces area with a bypass to the Lakeshore area using the underpass at the base of High Park for Queensway cars. At the Dufferin area, somehow get over to the north side with bridges over the railtracks – though that may impose Real Problems with clearances, and this is a point that should be ascertained, then pushed, that standards for urban rail crossings are excessive to the point of stopping needed transit from happening. Once on the north side of the railtracks from Dufferin, ensure there’s a stop near the GO Exhibition stop also accessible to Liberty Village. While the Fort York people could be somewhat unhappy with a new bridge over the Weston sub, it’s likely very unwise to think of tunnelling under the railtracks, but a bridge would work. While the view of the Fort would be further messed up, the upside is that most of the transit riders would be able to see the Fort without risk, and they could be more enticed to stop and visit the militaristic heritage that makes Canada our home on native land, though it did resist the Americans. Direct on Front St. ties into so many big destinations and as Front St. is wider than King or Queen, a ROW is more readily done, especially if it’s split between Wellington (westbound I think) and Front St. eastbound. Past EAs, eg. the FSE, and the WWLRT review, have not managed to unseat the Metro-era autosoars plans from prominence, and many of the blindp core politicians and commissioners are unwilling to both commit to doing good public transit and a rethinking of plans. So having sped-up EAs is actually worrisome. sigh, but thanks for doing this. The improvement to Ontario Place transit could be readily done by looping the existing Ex loop through the west end of the Ex to stop at the main entry to OP but always staying on the north side of the Lakeshore. Yes, it would need to push through the lower east end of the Ex, to regain the loop but maybe there’s an autovotive building that needs a transit stop? I remember seeing plans for Liberty Village with a possible Go Station being built on the line running between Western Battery Rd & Douro St. I’m guessing this won’t have anything to do with these future plans in the area? In any case, I’m glad to see they are looking into plans for the future. In the next 3 years, thousands will have moved into Liberty Village alone. Why don’t they go under Bathurst Street but swing north around The Fort via the more ample vacant railway land there. Long ago some dis-used sidings were torn out of here, part of this where the current Ex loop was installed. That would give them a direct straight run into the westbound loop tracks where they wanted to go anyway. I imagine there’s room for a new eastbound exit curve to be added to the loop swinging north to the new trackage. Send a non-revenue linkage up the future Bremner connecting ramp to Bathurst and the system connectivity is preserved. 1. The route is remote from the condos south of the fort and will therefore only carry passengers who are the long-haul customers from Parkdale and points west. 2. There is a requirement for 35 feet service clearance beside the rail corridor, and it is extremely tight just east and west of Strachan Avenue. Yes, I agree, the rest is fairly easy. Is that to cope with derailments? Would a similar clearance be required in the Weston corridor if an LRT was run through there? Would a suitably strong wall reduce the clearance width requirement? Steve: The requirement is for access to the tracks for maintenance equipment. In the case of the track north of Fort York, the service road is between the tracks and the south wall of the rail corridor. As for Weston, there’s a fair amount of space around the existing corridor in many places, but with the recent re-emergence of Blue 22 as a “build it now” project, this may be a moot point. I thought that was the whole point. There is no sense choking the new service through this area (other than with the Bremner lands to the east) when those condos facing Fleet Street are already and better served by both the 511 and 509 right in front of them. Just how much service does this tiny wedge area really need?!? The ‘express’ point of the excercise through the Parkdale area and into Downtown is to make the Waterfront West route as fast as possible. Why make the route painfully slow, especially when the cars should be quite thoroughly loaded by this point in the trip? You have said many times that no transit route can be everything to everybody. This area already has provision for sufficient and now upgradeable local service due to the Fleet Street ROW. I see no problem with letting the Waterfront West route serve primarily as express, especially if it is to ever attract a strong ridership base from South Etobicoke. Pale the thought that some portion of the TTC might actually become fast!